ideal for use in inkjet roll label printers, including Primera LX2000, LX900 and LX810 printers, Afinia L801 model and Epson ColorWorks C7500 printers. This product is suitable for use in the Primera LX 810, LX 900 and LX2000 Color Label printers. Please note: Label media is not interchangeable between LX400/LX500 and LX810/LX900/LX2000 Color Label Printers. 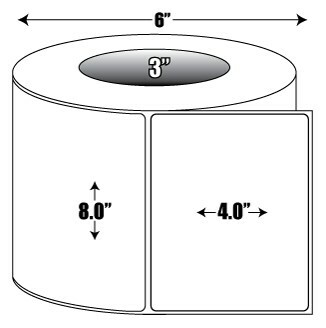 The LX810, LX900 and LX2000 have a 6” (152mm) maximum diameter on a 3” (76mm) core. The LX400 and LX500 have a 5” (127mm) maximum diameter on a 2” (50.8mm) core. The standard corner radius is .125”.